Sometimes the simplest ideas are best – and this pretty little potpourri scented candle lamp is so simple to make! Wouldn’t this be nice to give Mom for Mother’s Day or to make as a homemade Christmas gift? Project Instructions:Fill the bottom ivy bowl with potpourri. With the second ivy bowl, take the wide gathered lace and glue a hem at both ends. I used hot glue for quick results. Then run a basting stitch through to the other end. Don’t knot off. Lay the lace around the neck of the ivy bowl and pull the thread until it is gathered to the other end, adjusting around so you have nice even ruffles and knot off to the other end. You can also stitch down the two ends. Now with your 1/2 inch lace, go around the neck again, covering the the top of the 3-1/2 inch lace and glue to the other end. Take some thin ribbon to match your potpourri and cover the the top raw edge around the 1/2 inch lace and glue to the other end. 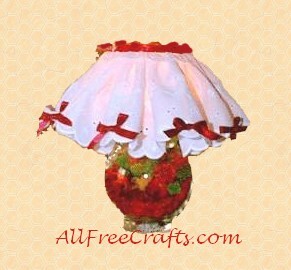 Make enough bows to glue to each ruffle on your fabric lamp shade. Insert your candle cup and candle and place on top of the ivy bowl with the potpourri. The fluted edges of the ivy bowls allow the scent of the potpourri to rise with the heat from the candle. Now you have a beautiful ivy scented ivy bowl candle lamp as a romantic, refreshing accent in any room. Caution: As always, never leave a lit candle unattended. What a fantastic idea for gifts! Thank you! Thank you, Becky. Glad you liked it!